Having worked in several Japanese companies before, I knew that the Japanese are indeed very detailed people, paying attention even to the slightest details. When it comes to food and their presentation, the Japanese will not hesitate to ensure that only the finest quality are used and the best presentation are served before your eyes. Even before you gonna had your first bite into the food, the presentation itself are just enough to win you over. So when Nana’s Green Tea whom is voted as the No. 1 Japanese cafe for matcha lovers, , made its debut appearance to the local audience, from the layout and design of the cafe, extensive menu to the food ingredients, you can be sure that all have been carefully tailored for. 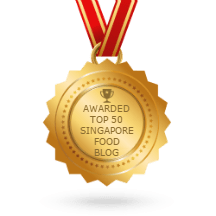 My initial expectation of the place was probably something aka an aged-old traditional Japanese restaurant where we would be seated on tatamis, with wooden coffee tables alike as the dining areas with the addition of various private rooms. After all, it’s a Japanese tea place, isn’t it ? Well, much to my astonishment, I was proven quite wrong ! Enhanced with a modern contemporay twist, the design of the restuarant serves to tell me that privacy can be attained even in an open concept setting. And this clever arrangement is designed by award winning architecture firm Mr. Masahiro Yoshida and its team at Kamitopen, leveraging on Nana’s attention to details once more ! Cosy and comfortable as I would deem it, it’s a perfect venue for friends and families gatherings. And the various lit frames, as you can see, has a significant meaning as well ! Suspended from the ceiling, the wooden frames make a curious table setting with Nana’s signature ‘cha-tsuru’ (tea leaves and crane) and covered with translucent rice paper used for a Japanese ‘shōji’ (door). The interior is lined with four rows of suspended square frames, similar to the exterior where there are unique tables that seats 4 to 6 persons per square frame. Renownedly featured as the ‘Japanese Starbucks’, Nana’s Green Tea is a major influencer in the cultivation of the tea drinking culture. All the green tea leaves in the cafe are imported from Kyoto only, which is the most famous production center of “Matcha”. So exactly what is this infamous “Matcha” that we have been constantly hearing about ? Matcha is a finely ground and powdered green tea. The tea used to create matcha is grown in the shaded misty mountains of Japan. This region receives very little direct sunlight. Incidentally, matcha is commonly known for its use in the traditional Tea Ceremony. The proper growing and harvesting of matcha is what gives it its characteristically vivid green color and incredible health benefits. 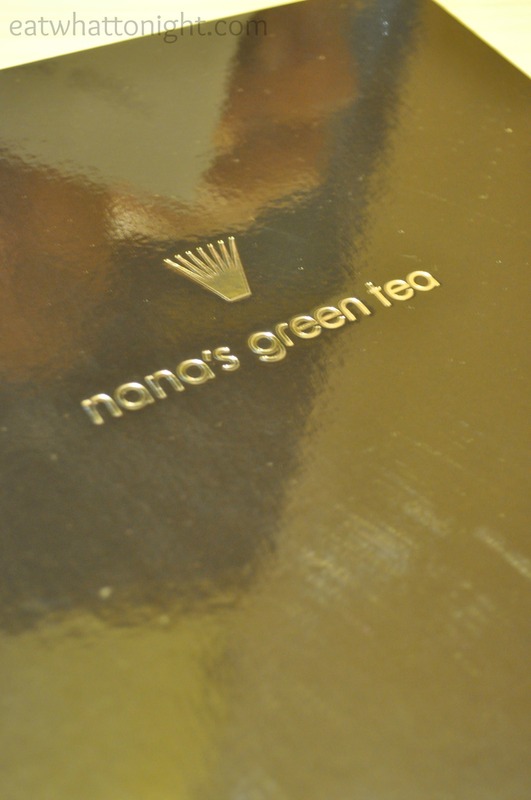 So has Nana’s Green Tea started to arouse your interest ? Well, be sure to read on, and you will further wowed by the amazing benefits that matcha contains. 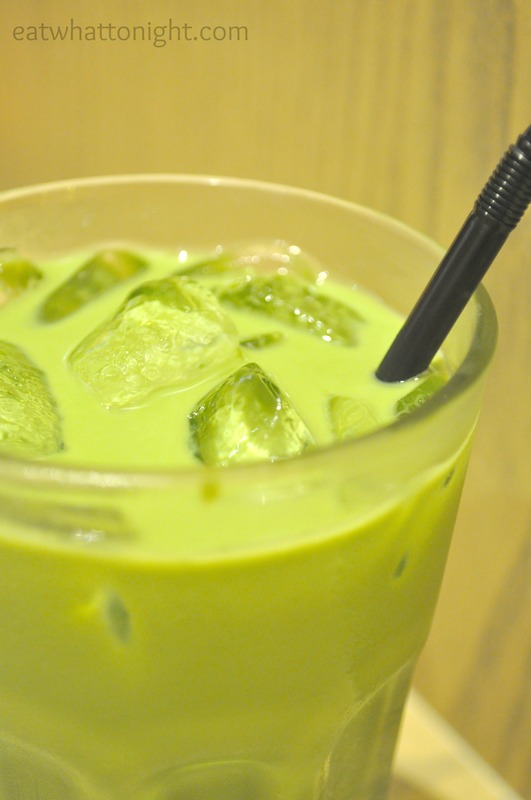 Matcha Latte, served in either hot/cold is a signature drink that you should not be missing out. On the first sip, I tasted bitterness due to the latte. Maybe I am not a coffee person to begin with. However, the after-taste was refreshingly-sweet and hey, upon more sips, the drink just grown to be more desirable. And did I mentioned about the Japanese’ attention to details ? Yes ! 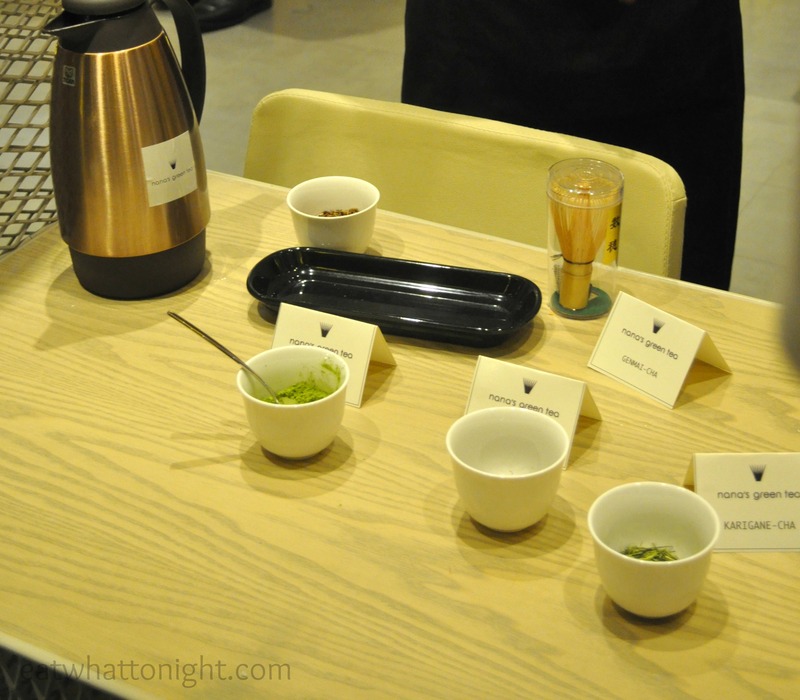 It is literated once more by the store manager, an authentic Japanese who introduces us to the various kinds of green teas that the cafe offers, followed by a demonstration on how green tea leaves are grinded into a powdery form in its freshness state. 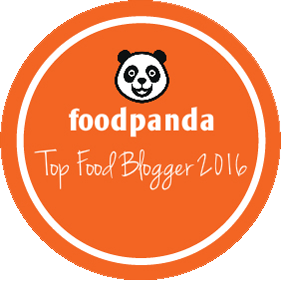 Let’s get down to our main concern for the day ~ FOOD ! Hahaha… All hungry for words now, aren’t we ? As understood, Singapore is Nana’s first store outside of Japan and its menu here is also the most extensive so far. 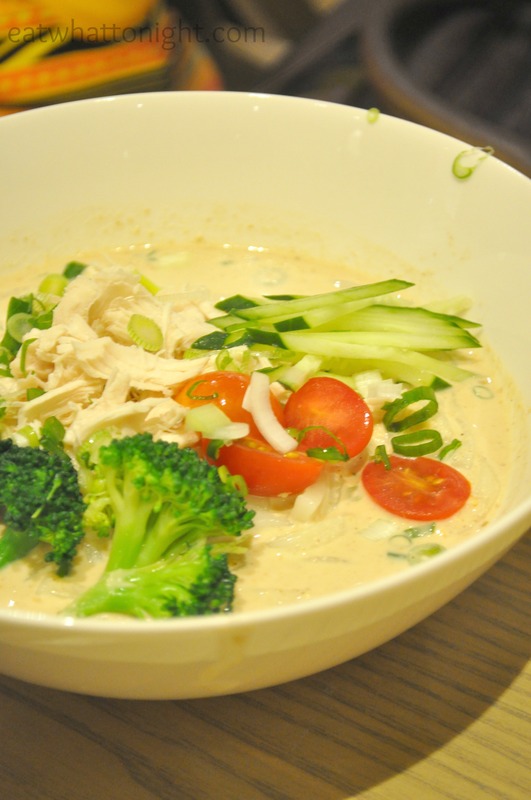 Unliked various Japanese food chains where the acclaimed Japanese food has been much localised, the deletable food served by Nana originates from true-blue Japanese’s authenticity. 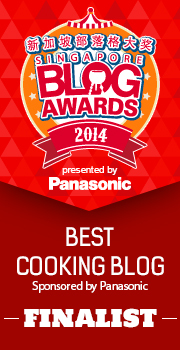 I must mentioned, we might bore the perception that quality Japanese food comes at a premium. 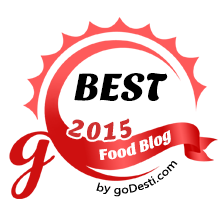 However, you will be surprised at the reasonable prices that Nana has to offer for its food. Though Nana has affordably market themselves in terms of prices, but the quality of food has not been compromised. 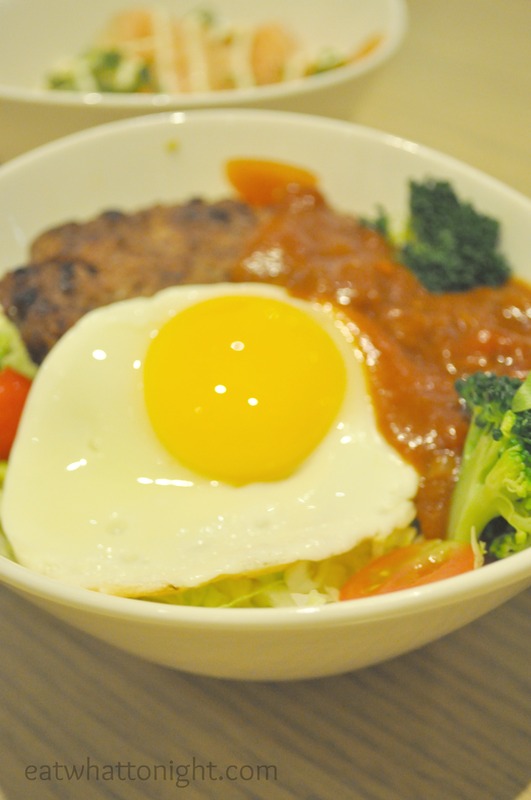 Locomoko Don ~ Beef patty served on warm Japanese rice garnished with lettuce, tomato, broccoli and sunny side egg. The quality of the Japanese rice is truly authentic Japanese pearl rice that offers a compelling match with the well-marinated beef patty. The sauce that accompanies the dish is a sweet and sour base, which adds favor to the otherwise simple garnishes. At $15.80, it is a delectable and filling dish, especially upon the completion of the sunny side egg. 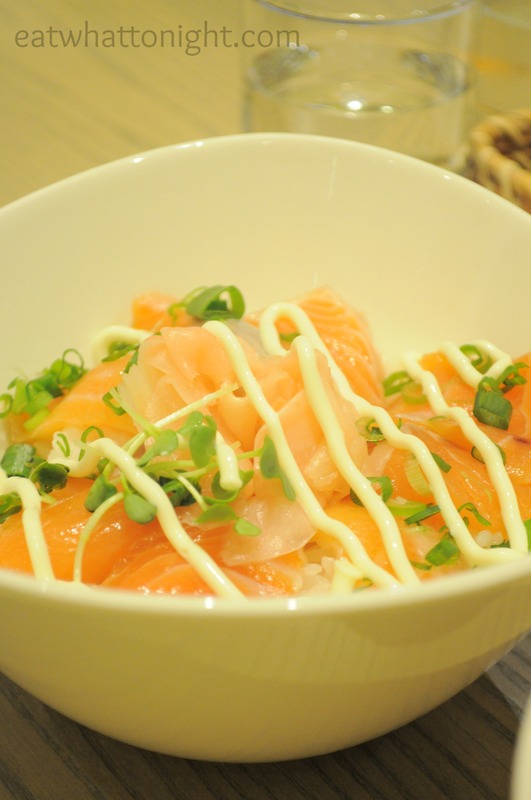 Salmon Don ~ As the name implies, salmon sashimi serves with pickled ginger, sesame seeds, daikon sprouts and spring onion. The freshness of the salmon sashimi speaks for itself. I am never a fan of picked ginger due to the gingerly-spice which I frown upon. Yet, I could finished the pickled ginger that comes with this dish. Instead of the spiciness, the pickled ginger comes on a sweet note and I suppose you would never imagine it being pickled ginger if you were to conduct a blind test on it ! Price : $14.80. Mushi – Dori Goma Dare Udon $13.80 ~ Steamed chicken fillets and Udon noodles garnishes with cucumber and served in Nana’s special sesame sauce. Served cold, it is entirely different from the Don we had earlier. The sesame sauce is the speciality here, somewhat salty, somewhat creamy. I would suggest you ordering a combi of this dish with one of the earlier Dons, so that you could have a variation of all the special tastes of Nana. My ex-boss used to tell me that he can never understand how his wife forever having a separate tummy whenever it comes to desserts. It’s like she could have half a bowl of rice for dinner or even lesser and she will be full. But if there’s an after-dinner dessert, she’s quick to jump into it. Hahaha. Well, that’s woman, isn’t it …. And I am sure Nana catches this special feature of woman well. The new menu offers a range of delightful dessert creations that are artistic and healthy like the Soft Cream Anmitsu, a soft serve vanilla ice-cream with red bean paste, white mochi and ‘Kanaten’ (traditional Japanese herbal jelly). Nana is really nice to cater to our request of having 4 different favors of its signature desserts for our feasting. 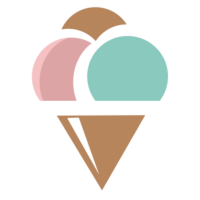 Seriously, I couldn’t make up my mind on which is the best, because all are equally GOOD ! 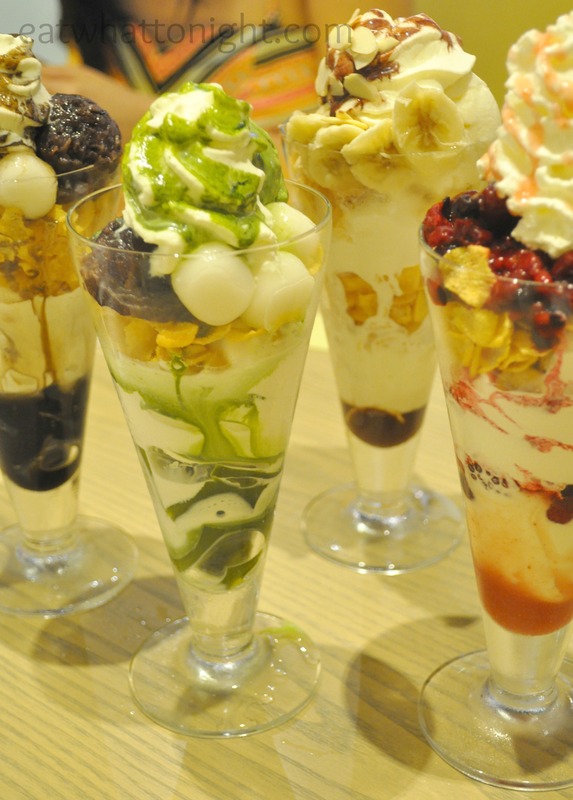 From left to right : Matcha Shiratama Parfait, Hoji Shiratama Parfait, Banana Chocolate Parfait, Berry Parfait. As everyone was busy taking pictures of these sweet desserts, the fresh cream on the Berry Parfait melted slightly. The server at Nana was quick to notice that and promptly replace it with a freshly made one. We were going like “wow, if there’s anything that should be criticised with this level of service standard, we would really be what the chinese proverb calls for “picking bones among the eggs 鸡蛋里挑骨头”. 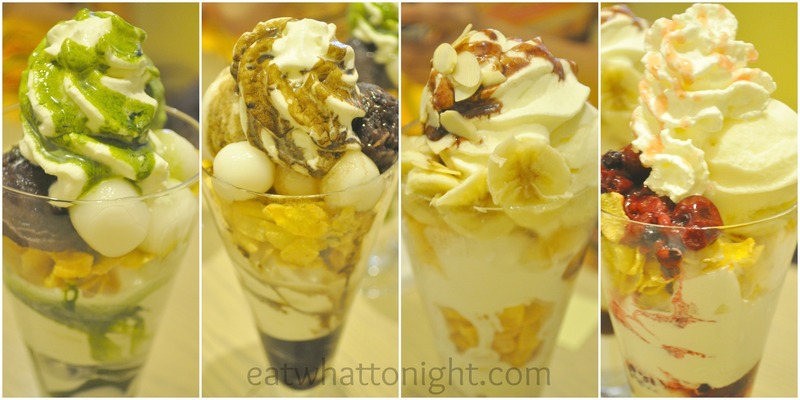 As you can see from the above pictures, each parfait comes with a generous amount of corn flakes. And as an enthusiastic baker myself, cornflakes served in cream will turn soggy easily. However, the parfaits from Nana does not seem to have this problem at all. Each piece of corn flake is still delightfully crunchy till the moment we are finishing them. 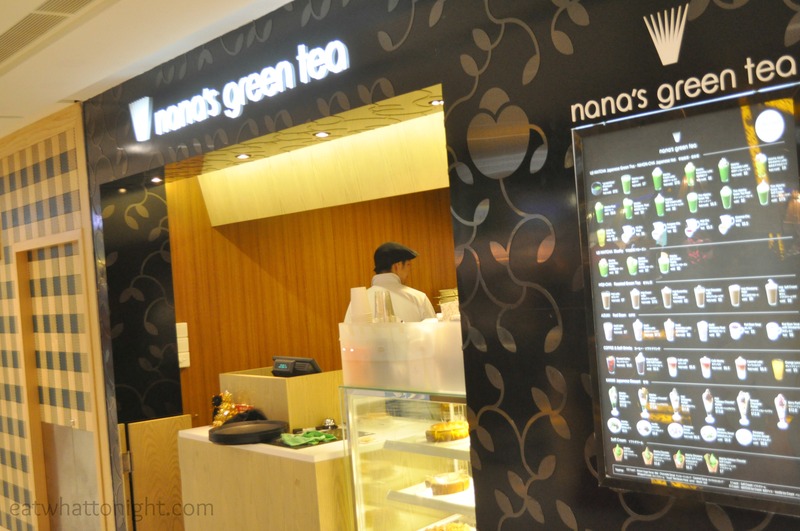 Tempted to pay Nana’s Green Tea Cafe a visit now ? 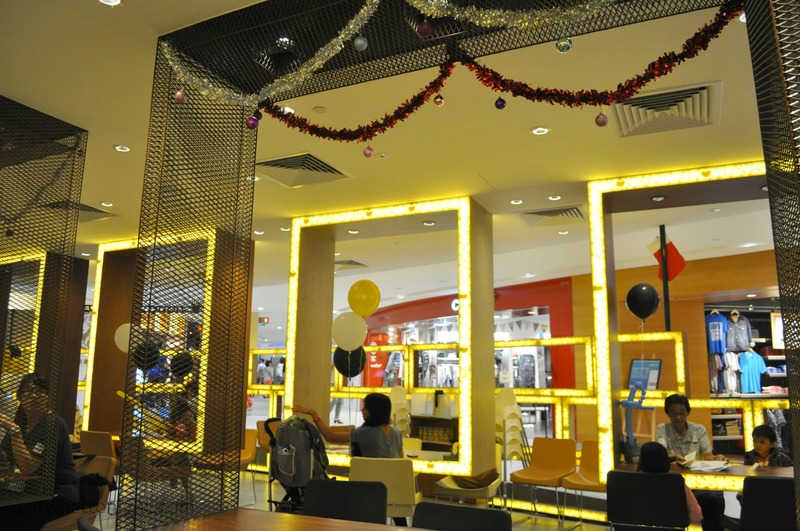 Hesitate no more and head down to Plaza Singapura right away !! A big thank you to Alisa of Publicist PR Consultants for the lovely invitation! 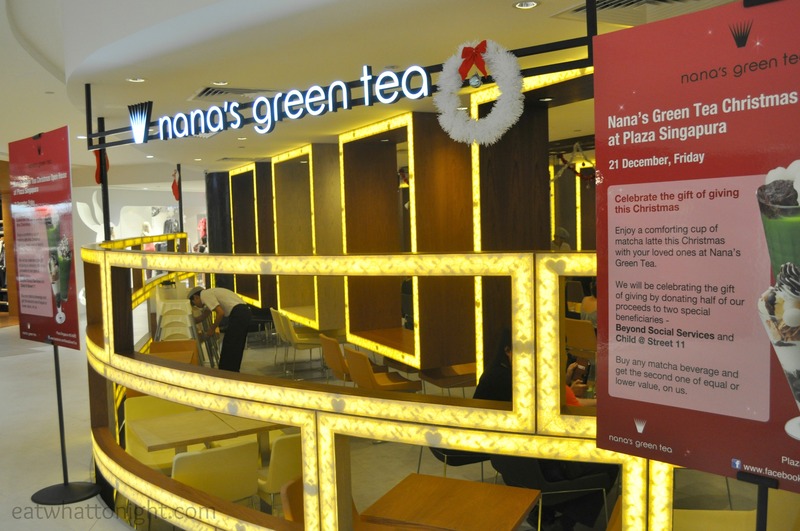 Let's celebrate Nana’s Green Tea Christmas Open House @ Plaza Singapura on 21 Dec 2012, with a good cause !! !